We're your distributor of the highest quality aftermarket hitch system products and accessories available. We offer a wide variety of products and provide a quick and easy way to purchase just about anything you can put in a receiver hitch. The newest innovation from Convert-A-Ball! 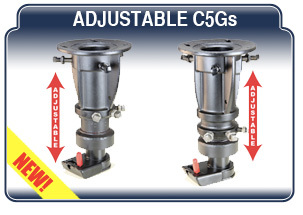 The Cushioned 5th-Wheel to Gooseneck Adaptor is now fully adjustable. There's no need to wonder if you've ordered the correct size anymore. This new adaptor, C5G1216, adjusts from 12" to 16"